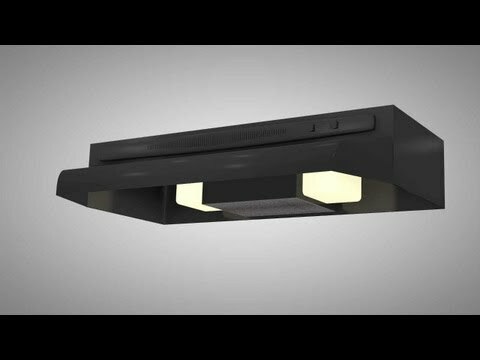 How does a range vent hood work? We're remodeling our kitchen. Do we really need a range hood? My vent hood doesn't get rid of all of the smoke when I cook. What's wrong with it? When should I turn on my hood? If I have a fire on my stove, should I turn the hood on or off? Can a vent hood catch on fire? My vent doesn't seem to work well anymore. How can I test it? Why won't my vent work on low? Cooking produces grease, moisture, heat and smoke that can damage cabinets and walls over time. Range hoods protect the cabinets, remove the grease, moisture and smoke, and provide light for the cooking surface below. Warning! Be sure the unit is turned off before you clean it. Use a non-abrasive, household cleaning spray or degreaser to remove grease and dirt from the interior and exterior of the hood. Avoid spraying the cleaner directly onto the light bulb, light bulb socket, or other electrical components. The thin, silvery screen is the grease filter (there may be more than one, depending on your model). It traps airborne oils and grease to keep them out of the blower and exhaust vent. To clean the filter, remove it and soak it in a degreasing solution until the grease is dissolved. Next, wash it with warm, soapy water to remove any traces of the degreaser. Then put it in the upper rack of the dishwasher and run it through a normal cycle. Make sure the filter is thoroughly dry before returning it to the hood. If your model circulates air, rather than vents it to the outside, it may have one or more or more activated charcoal filters which may also serve as the grease filter. Charcoal filters cannot be cleaned or renewed. Simply replace them annually or when they lose effectiveness. If your hood vents to the outside rather than just circulates, you need to regularly check the vent that leads from the vent hood to the outside to make sure there is no grease buildup inside of it. If this grease buildup catches fire it can cause significant damage. If grease is building up, contact a vent-cleaning or heating and cooling professional to clean the vent properly. While most vent hood fan motors don't need any maintenance, the motor and its bearings may become stiff due to the constant exposure to heat, humidity and grease. When that happens, you'll need to replace them. Additionally, over time, the blower wheel will become greasy and dirty. This will slow down the fan or cause vibration. Remove the wheel and clean it with a degreaser. If the fan is still slow or if it vibrates after cleaning, you will need to replace the fan motor. Enter your range hood's model number for troubleshooting and repair help information for many common problems associated with your model. It's easy to remove the filters and inspect them. By regularly checking the filter, you'll be able to tell by the particles and grease buildup if cleaning is necessary. If there is any damage to the filter, you'll need to replace it right away. Yes, you really do need a range hood. Without it, you'll find that your kitchen will accumulate grease and smoke damage and your home will be filled with cooking odors. Many hoods simply circulate the air and they do not vent to the outside. You'll need to check with your local municipality to see if there are regulations for this. Many municipalities now require outdoor venting systems, as they are more desirable from a comfort and safety perspective. Vent hoods are designed to handle a certain amount of smoke produced while cooking. If your cooking is causing your entire kitchen to fill with smoke your vent hood may not be designed to handle that amount, you'll need to supplement with additional ventilation and air circulation. Try opening windows and installing a ceiling fan. You should use your range hood whenever you're cooking on your stove. Follow your owner's manual for recommendations about using it when you're using the oven. If your hood is part of a built-in microwave oven, consult the owner's manual, as it does vary with this type of model. Off. The fan could draw up the flames into the ductwork, causing the fire to spread faster. Be sure to keep a fire extinguisher in an easily-accessible location in your kitchen. Yes, vent hoods get coated and sometimes clogged with grease – and that's a fire hazard. It's important to periodically check and clean and replace as needed. If your hood vents (rather than just circulates), you need to regularly check the vent that leads from the vent hood to the outside to make sure there is no grease buildup inside of it. If there is, contact a vent-cleaning or heating and cooling professional to clean the vent properly. Some work quite well. Others do not. During heavy cooking, when you're using several burners simultaneously, or when you're cooking in tall pots, the over-the-stovetop vent systems work best. Cut an eight-inch x eight-inch (approximately 20-cm x 20 cm) square of newspaper. If the vent holds the newspaper in place, your vent hood is most likely working properly. If the paper falls, the hood filter may be clogged – or the ductwork to the outside may be too long, which can cause poor venting performance. Most hood fans have a multi-speed motor. When you select one of the levels (low, medium, high, etc. ), power goes to different parts of the fan motor. A problem with speed selection can be the fault of either the selector switch itself or the motor. Check out our troubleshooting and repair help information for range vent hoods.